Home English news It is normal to be different. First of all it is interesting to spotlight that those people suffer a lot from prejudice, and sometimes, it begins at school; That causes problems to the victims and their families. Most of them fear the school because they don’t want to be treated as if they were different or less important than the others classmates. Because of this, many disable people have never gone to school or studied at home with their families. In 2018 at CIEP 117 Carlos Drummond de Andrade Brasil-Estados Unidos, one class of freshmen realized a project called ”Coffee With Diversity” and each group of students could choose a theme, develop and shared it with whole school. A group of friends has chosen “Disabilities” as their theme, they did a huge research with people from all over Brazil, and after they studied the answers they called specific people to school to give lectures and talk about their experiences and professional knowledge. In their research they had observed that although some people had a good development at school, they saw a lot of problems. One of the interviewed person said “ Though she was included, in some moments the child realizes that is different from their friends, and that they keep distance because of it. It isn’t always, but happens.” Maybe it is difficult to imagine, but that causes a lot of problems for the victim and instead of having fun, making friends and studying the person gets more sad and distressed with the situation. Those people don’t deserve to be treated like this. They are not abnormal, they are just different. The difference shouldn’t be treated as something awkward, it is necessary to include them in the society and understand that they are not less important or disgusting. They are just different, and there isn’t any problem in being like this. 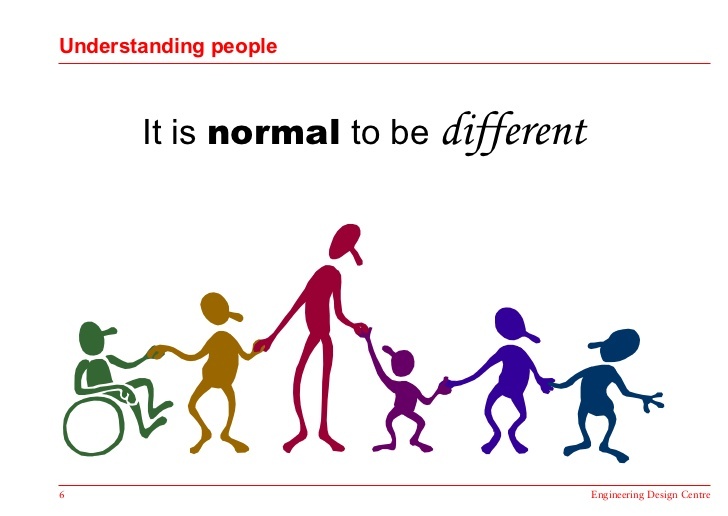 It is normal to be different.